What is the time zone of Southern Patagonia? Both Chilean and Argentinean Southern Patagonia are 3 hours behind GMT. What language is spoken in Patagonia? Spanish is the official language of Chile and Argentina and their different regions, including Patagonia. English is spoken in the main tourist centers, important hotels, on our trips, by our guides but not by the general population. If you require a guide in a language other than English or spanish, you should let us know well in advance and an extra fee may apply. How are the local people in Patagonia like? People in Patagonia are very friendly and service oriented. Generally, in Patagonia you will encounter locals at the hotels, parks and public spaces. It is pretty common to be offered “mate” tea by locals as welcome sign of friendship. Mate is a type of tea made out of herbs that naturally grow in northern Argentina, Uruguay and the south of Brazil. This tea is shared amongst the group in a goblet made of dried pumpkins, and drank through a metal straw. Follow your guide's recommendations as to your conduct when relating to the local population. For example, some people enjoy being photographed while others are quite offended by it. Always ask your guide when in doubt. What currency is used in Patagonia? When in Chilean Patagonia, the offician currency is the Chilean peso. Many of the hotels will accept US dollars in addition to Chilean pesos, but we recommend only using pesos at the local shops. In Argentinean Patagonia, the official currency is the Argentinean Peso. Most hotels and local shops in Argentina accept both US Dollars and Argentinean pesos, but as a precaution it is always better to have Argentinean pesos in hand when on the Argentinean side of Patagonia. How safe are Chile, Argentina and Patagonia? Will my safety/security be in harm’s way in any way? Like most places around the World, Chile’s and Argnetina's major cities have good and bad areas. Many of the best hotels are located on good, safe areas. You should take the same precautions as you would if you were to travel to a major city such as New York or London. Be mindful of pick-pocketers when walking in the street or in crowded public areas. Don’t walk around with expensive jewelry or with a lot of cash on hand as the vast majority of stores accept major credit cards. Use only registered and certified taxi cabs. Be wary of people who randomly approach you. Don’t venture into places you have not previously asked about. The major towns in Southern Patagonia are Puerto Natales in Chile and El Calafate in Argentina. Both of these towns are very safe and you can walk on the streets after dark. ON CLIMATE & WEATHER - when to visit, air temperatures, etc. What is the climate and weather like in Patagonia? Each season in Patagonia has different weather conditions. For detailed information on what the climate and weather is like during each particular season, please visit our page on Patagonia Climate and Weather. Contrary to common thought, Patagonia is a year-round destination and each season is unique in its own way. Within the seasons, there is really no better or worse time to visit. Rather, one should plan a Patagonia adventure based on your interests and determine which season is the right season for you. Below are a few highlights of each season to help you choose the best time of the year to go. For more information, please visit our page with details on When to Visit Patagonia. Is there an entrance fee to enter Torres del Paine or Los Glaciares National Parks? If so, what is it? What are the rules and regulations of the National Parks? How strict are they? Although Quasar Expeditions hires only the best, naturalist guides, their job is not only to guide, teach and serve but also to enforce all National Park regulations. We strongly recommend you follow and obey your guide’s discretion at all times. For more info please refer to our page on Torres del Paine National Park and on Los Glaciares National Park. ON PRE-TRIP ESSENTIAL INFORMATION - booking and payment policies, travel documents, insurance, tipping, etc. What are Quasar Expedition’s booking and cancellation policies? Our booking and cancellation policies can be found on our Booking Terms & Conditions page. What are Quasar Expedition’s pricing and payment schedules? Our pricing is on a per person basis, for either an 8 night/ 9 day or a 5 night / 6 Day Overland Safari. The payment schedule for your booking will depend on how far in advance you book. If you book 65 days or more in advance of your trip departure date, you will have to make a deposit to confirm your booking and the balance will be due closer to your departure date. If you book less than 65 days before your departure date, you will most likely have to make payment in full to confirm your booking. Be mindful that should you decide to cancel, refund of your payments will be subject to the date of your cancellation based on our cancellation policies. We accept all major credit cards or you can also pay through bank wire transfers or by sending us a check in the mail to our USA offices. Please refer to our Booking Terms & Conditions page to get exact dates and figures for payment schedules and cancellation terms. According to Chilean and Argentinean Immigration regulations, every foreign passenger entering the country must have a passport valid for up to 6 months counting from the return date to your country of origin. Certain Latin American countries that are part of the Mercosur alliance, only require a valid ID card to enter both Chile and Argentina. Please inquire with us if you have questions on the documentation required for your Country. All passengers should have full medical insurance and trip-cancellation insurance. Be mindful that Patagonia is a remote location with very basic medical facilities at hand. Emergency medical evacuation can cost upwards of tens of thousands of dollars. Your Insurance company should be able to assist you with the best options for your particular trip. Please visit our Trip Insurance page to get more information on companies and coverage policies we recommend. The most important recommendation is: always carry with you Quasar Expedition’s local emergency phone number. In case of an emergency, this should be your priority contact in order to receive immediate assistance. You will be given our emergency phone numbers when you book any trip with us. You can also find this number on the General Contact Information of the Contact Us page of this website. Tipping is always up to passengers and is a very delicate matter for us. Throughout the years we have often been asked what gratuity would be appropriate to leave for the guide and hotel staff. It is our recommendation that the quality of service should determine the extent of any gratuity. For example; if the service received from your guide has been excellent, a suggestion of USD $15 - $20 per day, per guest is recommended. For your hotel staff, if service has been excellent, we recommend you tip around USD $10 per guest per day at each hotel. Please understand that this is a suggestion only and that tipping and gratuities are a very personal matter. How much money / cash should I bring to a Patagonia trip? Here are some guidelines if you decide to pay most things with cash. Amounts are in US Dollars, and you will have to change these to Chilean and Argentinean pesos while in Patagonia: Tips/Gratuities (per guest): $200, Fuel (per vehicle): $350, alcoholic beverages at the different hotels (~$8 per drink. There are also several souvenir stores in the towns of Puerto Natales and Patagonia and some do not accept credit cards. What is the duration of a Patagonia Overland Safari? There are 2 Trip Durations for our Patagonia Overland Safaris. Our Chile & Argentina Safaris are 8 nights / 9 days, from Friday to Saturday. Our Chile only Overland Safaris are 5 nights / 6 Days, from Saturday to Thursday or from Monday to Saturday. The trip can be extended with stays in Santiago - Chile, Buenos Aires - Argentina, or more extensive trips to wine country in Chile or Argentina, or full visits to the mighty Atacama Desert and Easter Island. Please inquire with us about extending your Patagonia trip. Currency in Chile is the Chilean Peso and in Argentina it is the Argentinean Peso. For the latest exchange rate of both currencies with your countrie's currency, please visit http://www.xe.com. Many shops in both countries accept US dollars, however we recommend that you change your money to the local currency when you arrive. Higher denomination bills often get a better exchange rate than lower denomination bills. All Banks are open to the public from 9:00 hrs to 17:00 hrs. Monday to Friday. Some banks open on Saturdays up until noon or 14:00 hrs. Most banks in Chile and Argentina will allow you to make a transaction with your National bank. Automated Teller Machines can be found all across Chile and Argentina, including the inhabited towns in Patagonia. While on a Patagonia Safari, you will have access to an ATM only when you are in the towns of Puerto Natales in Chile, and El Calafate in Argentina. Most ATM's accept international ATM cards. Shopping hours in Patagonia are from 10:00 (AM) to around 18:00 (6PM), Monday to Saturday. Some stores are open on Sundays. Good general health is required for your travel to Patagonia, as you will take walks and hikes in often cold weather. If you take medication regularly, we advise you to take enough for the length of your trip. Please advise us if you have any medical condition, which may require attention, so we can be prepared should an emergency arise. If you are vegetarian, allergic to any food or under a special diet, please let us know in advance, so we can comply with your requirements. Are any vaccinations/ immunizations required? No vaccinations / immunizations are necessary to travel to Chile or Argentina. What type of medical services and facilities are available? Modern hospital facilities are not available in Patagonia. The towns of Puerto Natales in Chile and El Calafate in Argentina have small hospitals and drug stores. We recommend to bring your own medicine as brands may change from one country to another, or a specific medicine may not be available. Due to the lack of services and medical facilities, we strongly recommend you get emergency medical evacuation insurance. Hotels like The Singular, Altiplanico, Eolo and Altavista are close to the main towns in Patagonia and have easier and faster access to a doctor, should you require one. We cater to all special dietary requirements, including vegetarian, kosher, lactose-intolerant, etc. Please let us know in advance if you will require a special diet while in Patagonia. As a general recommendation, do not drink tap water while on your trip. Drink only bottled water. We provide fresh, purified water bottles at each of the hotels where you will be staying. Also, avoid clams (which are served uncooked) and any uncooked or unpeeled products. Do not eat in any place or restaurant not recommended directly by us. Try to avoid eating at local markets as well. Facilities for special needs i.e. : wheelchair ramps, wide doors, etc. are not always available in Patagonia. BEFORE you book a particular tour you should inquire about the possibility of attending with your particular disabilities. We will provide you with accurate information and will do our best to accommodate you. During your Patagonia Overland Safari, you will have cellular reception when in the towns of Puerto Natales and El Calafate, and at certain properties around the perimeter of these towns. Data/3G/4G roaming reception can only be guaranteed when in Patagonia, as weather often affects mobile data coverage. Make sure you activate a Data Roaming Plan with your mobile phone provider prior to your trip if you wish to use your phones while on your trip. Please check your itinerary as well, to see when you will have cellphone coverage while on your trip. We offer satellite phone services on each of our Jeep vehicles. The first 10 minutes of use are free of charge, and we will charge $4 / min for each additional minute used over the 10 minute mark. Satellite phones are meant to be used for emergencies mainly, and you will have all the normal communication facilities available at your hotel each evening, including phone services and internet. Internet services are available at ALL the properties we use in Patagonia, although weather can sometimes affect the quality and speed of the service. If you bring a mobile device with you, such as a phone or a tablet, you will be able to access the internet each day at the different properties. Internet and Wifi services are not available around the National Parks. Electricity in both Chile and Argentina is 220V, 60 hz, AC. Chile has Type C plugs while Argentina has Type I plugs. Travelers coming from the United States, Europe and other countries with different plugs or with 100v devices, should bring their own converters as it is not easy to find them in Patagonia. Please refer to http://www.worldstandards.eu/electricity/plugs-and-sockets/ for details on the plug types of Chile and Argentina. We will provide you with a Quasar Expeditions’ emergency phone number which you can use in case of any emergency during your trip. You can also share this number with friends and family so that they can reach you in case of emergency. For a very detailed list of what to bring in terms of Gear and Clothing, please refer to the Patagonia Packing List section of our website. Dressing up is not required, though many of our guests prefer to dress up for dinner. As a guideline, don't dress up too fancy, rather casual formal: a nice dress or pants and blouse for women and pants and shirt for men. We suggest you bring a photo or video camera, binoculars, small back pack, additional batteries, SD cards for your camera with ample disk storage or bring a laptop to transfer your images. Do not pack a hair dryer as we offer these onboard. Sun lotion (we recommend high factor: 30+), personal medication, personal toiletteries, resealable bags such as zip-lock bags to keep cameras and equipment dry during excursions. Please refer to the Patagonia Packing List page of our site for more details. We recommend you take a soft sided bag to Patagonia. You will only need the essentials in clothing and personal items and space is limited on the back of the Jeeps. A good duffel bag with wheels works best as it can easily fit in the Jeep and can be rolled around at the airports and hotels. On flights to Patagonia you are allowed a maximum of 23 Kg (50 pounds) of luggage (excluding your hand-bag and carry on). All guests will need to fly in to Santiago, Chile or Buenos Aires, Argentina before they can continue south to Patagonia. From Santiago or Buenos Aires, you will take a domestic flight to either the town of Punta Arenas in Chile or to El Calafate in Argentina. Flights are around 2 1/2 to 3 1/2 hours. For additional details, please refer to the How to Get to Patagonia page of our website. You will have to clear customs upon arrival to Chile and Argentina. All of your personal baggage will be scanned for items such as fresh fruit and or other fresh plant and animal goods. Patagonia airports do not have customs since there are no international airports, however you will have to go through customs at the border control points when we cross from Chile to Argentina (or vice versa) on the Jeeps. After you disembark your flight, you will proceed to the Baggage claim area of the airport to pick up your bags. Once you exit baggage claim area, your guide or driver will be waiting for you. He / She will identify himself to you by holding a sign with your last name or the name of your group on it. Your guide, along with other Quasar Expeditions’ staff, will take care of your baggage and will safely take it to your vehicle. If arriving in Punta Arenas, you will have another 2 1/2 to 3 hours by land before you reach your hotel. If you arrive in El Calafate, you will have another 25 to 35 minutes by land before you reach your hotel. DURING YOUR PATAGONIA OVERLAND SAFARI - spoken language, alcoholic beverages, Quasar Expeditions Gear, dressing up, difficulty of walks/hikes, additional activities, etc. Is English spoken at the hotels? All personnel in the hotels as well as our naturalist guides speak fluent English. Most of them are multi-lingual. Please inquire with us to see if we can provide staff in your native language. Are alcoholic beverages offered on the trip? Wine is included during dinner at many of the properties where you will be staying, while others do not include any alcoholic beverages. Hotels accept all major credit cards and cash to pay for bar bills. Please inquire with us for details on what alcoholic beverages are included at each hotel. For those interested in all-inclusive programs that include unlimited alcoholic beverages, we do offer these programs at several properties in Chile including: The Singular, Tierra Patagonia and Patagonia Camp. Please inquire with us for rates. What is available at the hotels and how can I pay for purchases? Most of the hotels in our programs offer small boutiques that sell t-shirts, polo shirts, jackets, hats, scarfs etc. You can also purchase sun lotion, insect repellent and other items of similar nature at these shops. If you make any purchases at the hotels, you can settle your bill upon check-out by paying with any major credit card or with cash. How challenging are the walks, hikes? Is the terrain difficult? The terrain is different all around the National Parks in Patagonia, however our Overland Safaris can be as active or as passive as you want them to be. We offer short walks and hikes around the National Parks with beautiful views and plenty of wildlife, and we also offer very long treks that take you to more remote overlooks and highlights around the Parks. How active or how passive you make your daily outings is entirely up to you and you can enjoy Patagonia according to your level of fitness and your interests. Please let us know what your travel interests are, how active you want the trip to be, and we will be glad to put together the perfect trip for you. What activities are included in an Overland Safari? All our Overland Safaris include a basic set of activities and excursions, which include walks & hikes, horseback riding, activities at the glaciers and Jeep tours. Furthermore, the activities that are included also depend on whether you have selected a SELF-DRIVE or a GUIDED Overland Safari. Please refer to our Guide to Excursions document to learn which activities are included in your trip. Special excursions in Patagonia may be organized after your Safari. These include more technical hikes, rock climbing, kayaking, long horseback riding and whale watching. Please inquire with us about special excursions after your trip. We offer a series of extensions to complement your Patagonia Overland Safari. 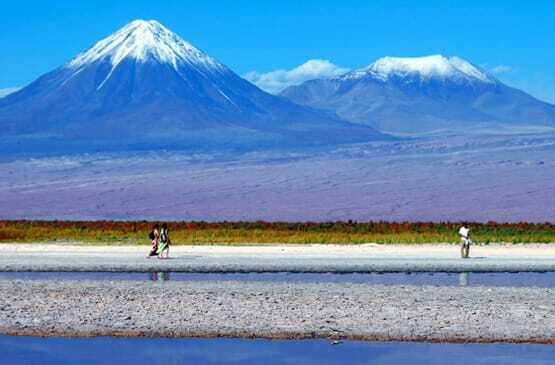 In Chile, you can extend your stay to visit the central wine valleys, the Atacama Desert and Easter Island. In Argentina, you can extend your stay to visit the wine valleys of Mendoza, Ushuaia / Tierra del Fuego, Salta, Jujuy, Buenos Aires or Iguazu Falls. We also offer trips to Machu Picchu and the Galapagos Islands. Please refer to our Trip Extensions Page of our site for more details.